TANGO NIGHT @ El Cafecito! Hosting this event with my friend Tania Rogova. 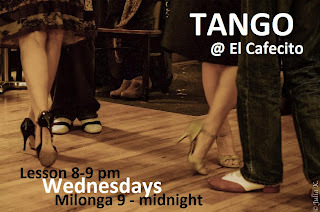 Just a casual evening where folks enjoy a mid-week tango treat. It takes a community to tango, so come in to relax, share a dance, meet new people, or just sit back and enjoy the cozy atmosphere. The coffee is good, empanadas are delicious, and the music goes straight to your heart! El Cafecito Espresso Bar, 3 Westmoreland Ave. (one street west of Dovercourt, just North of Bloor).